A ship is safe in harbor. But that’s not what ships are for. This “call” was an offer on our home. With a closing date of August 27. Yep. You read that right. We have one month to get everything outta here and get ourselves to California. My sense of anxiousness and ennui has been totally replaced by a sense of panic. Fortunately, an old friend came to visit that night. We’ve known Ben since the days when Jon worked at BYTE Magazine. He has always been “a friend in need and a friend in deed.” That is, the first time Jon was laid off with 2 days’ notice, Ben was the guy who traveled over from the coast to spend time with Jon, listening to his fears and worries, encouraging him to believe in himself, and also bringing lots of rum. Really good rum. He and Jon sat on our beautiful porch on the second floor, and helped the sun set. As always, Ben brought good cheer, funny stories, fond memories and new hope for the future. And just before he left the next morning, just as the numbing reality of what lies ahead hit us, he gave me the exact words I needed to hold in my heart for the month ahead. Ben has always been a sailor. He and his family spent a number of years on a sailboat, traveling around the Canary Islands and later the Caribbean. He still pilots a research vessel for UNH in Portsmouth, NH. And he knows about ships and harbors. But even harder is the un-mooring. And so many folks never leave. We were silent a moment. Once again, just when things seem really really hard, someone crosses our path and tells us exactly what we need to hear to take the next step. It is uncanny. It is surprising. It is a gift. No, more than that. This morning we awaken to yet another thunderstorm, a wet and cloudy day. We find it hard to get out of bed, but finally we do. We create a flurry of posts on Facebook and Craigslist: Canoe for sale, hot tub for sale, kiln for sale. Cat and dogs? Nah. Just kidding. We take a deep breath and plot out our day. The thunderstorm cools the air somewhat. A good time for me to split stuff the barn attic into two piles, “keep” and “let go”. I find myself thinking about what we’ll leave for the new family that will live in this beautiful house. The antique flag. The original brass house keys. Maybe the wooden doll house? I’ll be sure to tell them where the pets are buried, behind the garage in the back yard. Rex, beloved collie of the family before us. Leia and Puffy, our hamsters. Gus and Max, our elderly cats. Mavra, the sweetest rat in the world. Various injured beasties that came into our care for a short while, as we gave them a safe place to die in peace. I am so thankful for the years we’ve had in this town, in this house, in this safe harbor. I am so thankful another family will fill the rooms with laughter, and tears, and joy. I am so thankful for the miracle of a few well-chosen words, at just the right time. And as I work, I calm the frantic thoughts and the powerful beating of my heart. I say over and over to myself…. A ship is safe in harbor. But that’s not what ships are for…. 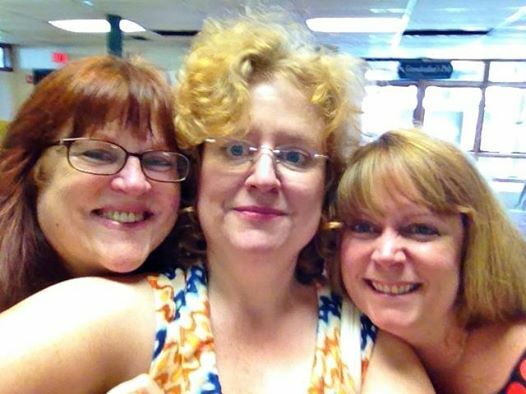 Me, Melinda and Stacey Herlitz, manager of the the Craftwear exhibit at the League of NH Craftsmen’s Fair. Well….every single day, I face a shifting landscape. 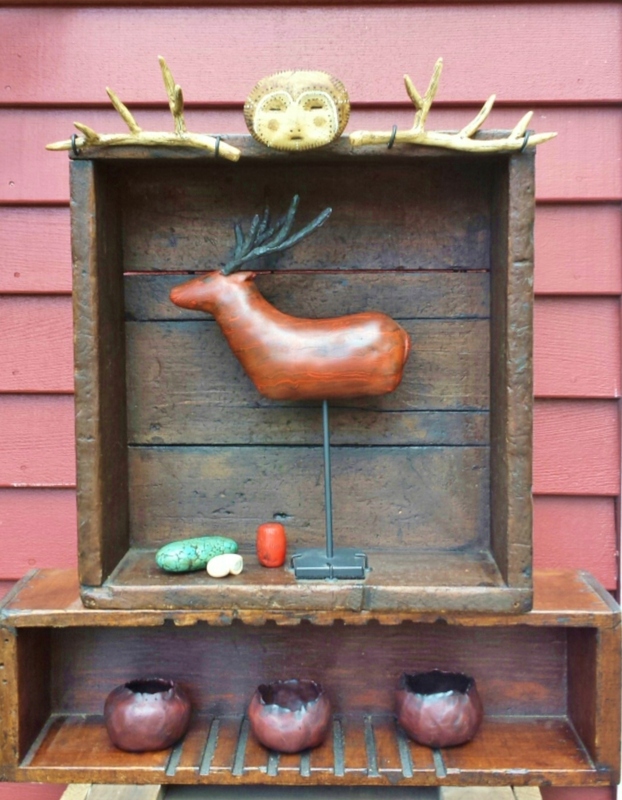 Tomorrow is my last chance to deliver artwork for two exhibits at the League of NH Craftsmen’s Fair. 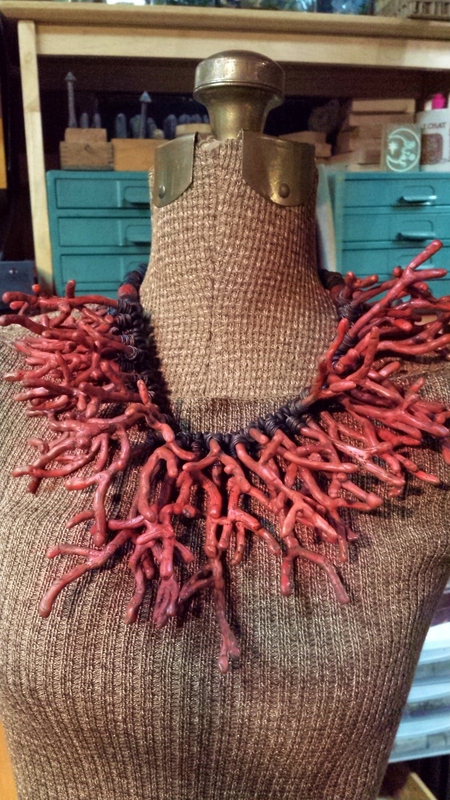 I just finished putting the last touches on two “boxed pieces”, and my feral coral necklace is ready to go, too. 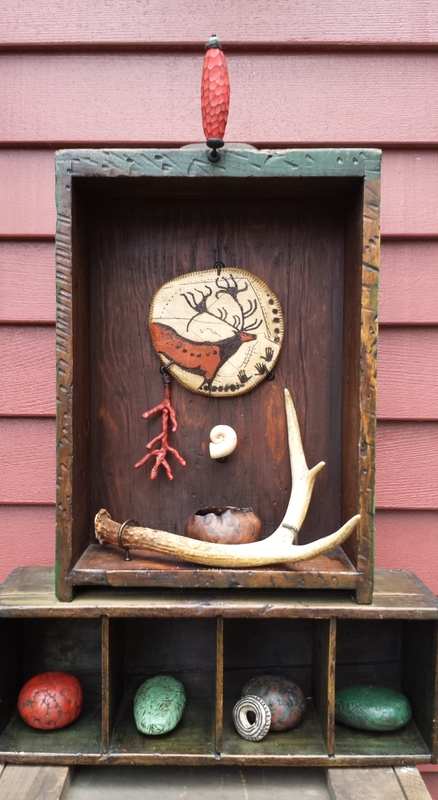 Everything is polymer clay, except for the single antler and the antique wood boxes that I cleaned, repaired, painted, refinished and waxed. I’ve nicknamed this the feral coral necklace, but it will have a beautiful new name by tomorrow. All polymer clay. I made an armature for each piece of faux coral. It’s a bittersweet day. This will be my last League Fair, and I won’t have a booth. I knew our lives would be in major upheaval by now, and it is. 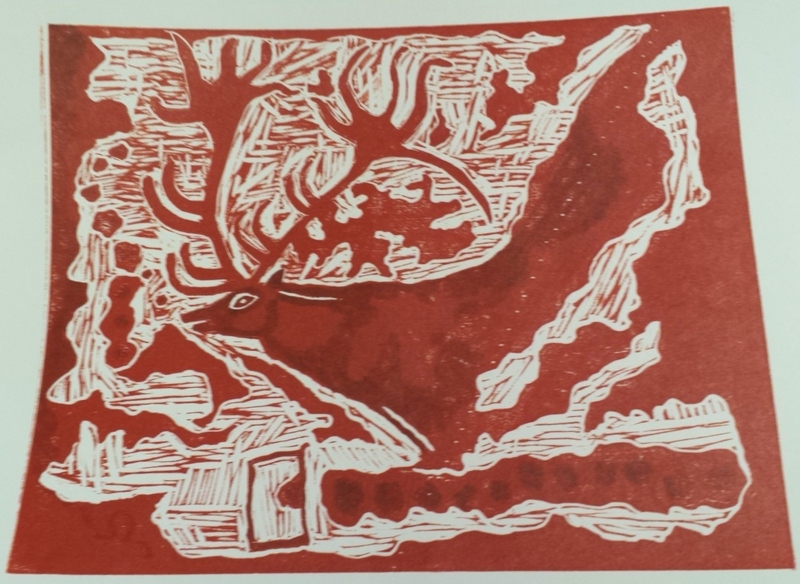 And to complicate things even more, I told a friend I would take a woodblock printmaking class with her last weekend, and I did! How crazy is that?! Well, actually….. Sorry for the floppy picture. 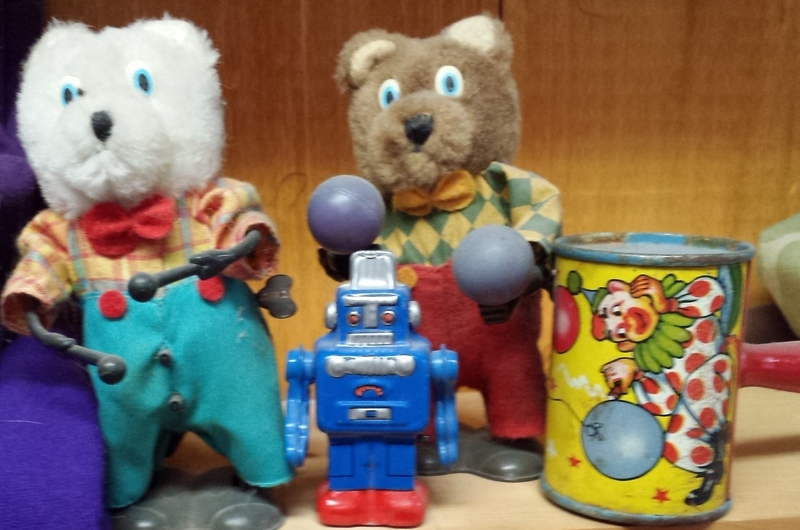 There is truly not a single flat surface in my studio right now…. Someone is also interested in our house. They called out of the blue on Monday afternoon. It might be perfect for them. And if they decide to go for it, we’d have to move before the end of August. So. Do we go into general panic mode and heave everything into a dumpster? Or wait and see, and run the risk of having even less time to pack everything up?? I dunno. And shortly, I won’t care. I’m celebrating the completion of my three exhibit pieces by making a pitcher of mimosas in ten more minutes. If you need me, I’ll be sitting on the second floor porch, trying to drown my anxiety in sparkling white wine and my daily dose of Vitamin C. Tomorrow is another day, with a whole new game plan. And since I won’t know til tomorrow what it is, why waste another moment worrying about it? P.S. 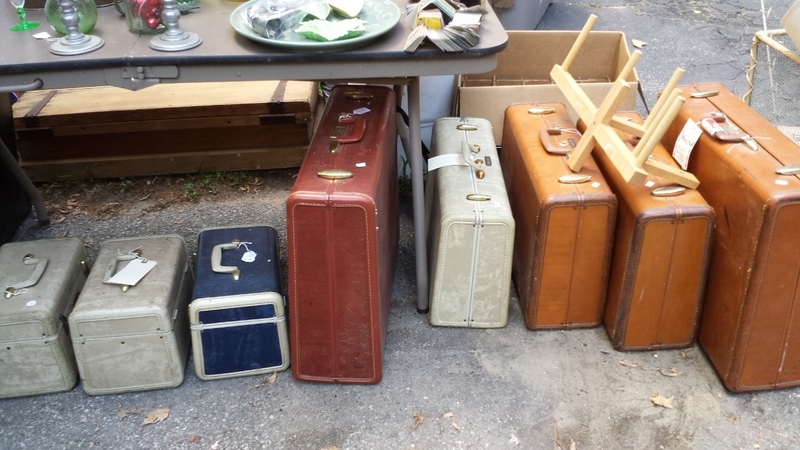 To be safe, we’ve decided to have a yard sale every Saturday for the rest of the summer. (I’m not joking.) I’ll keep you posted! I liked the article. The findings did not change my mind, especially since the study focused solely on drawing. I drew a lot as a child, so many people called me an artist. But I never really progressed past drawing horses, mice and rabbits. I took a few figure drawing classes in college. I enjoyed them–I like drawing bodies!–but didn’t pursue drawing after that. I still don’t really care for it. I have no idea if I have that “innate” talent for drawing or not. I don’t know if I have the “artist’s brain” the study described, or not. And I don’t care. I rarely draw out my designs before making them. I work them until they feel “right”. Drawing is an admirable skill. But what about a beautiful singing voice? What about a honed sense of rhythm, timing and hand coordination that’s so critical to drumming? What about making a beautiful pot? Or weaving/quilting/wood working and other fine crafts? Why do we value one form of art-making above all others, and make that the definition of an artist? And why do we value one kind of intelligence–I.Q.–above all others? So here’s my meandering thought trail…. 1) When I was in middle school, there was a bright, well-liked young man. He didn’t get good grades, so I assumed he wasn’t a good student. After getting a particularly bad grade for a project he’d poured his heart into, he ran out of the classroom. I hate to admit this, but we laughed. And the teacher–Mrs. Nancy Nash, one of my favorite teachers–scolded us. She said, “You think he’s not smart. But he is! He’s just not good at reading. Haven’t you ever realized how well he does in class discussions?! You should be ashamed!” She went out after him, and eventually they both returned to class. And we sat, chastened. And thinking. This was in the early ’60’s. No one knew about dyslexia, or learning disabilities. If you didn’t get good grades, you weren’t smart. Period. But now there was a new thought in my head….. Different kinds of smart. 2) Fast forward to freshmen year in college. No, I wasn’t in art school. I couldn’t get in! But another woman across the hall from me was. Curious what a “real” artist looked like, I asked her about her major. She was taking the prerequisite drawing classes, the ones every art student had to take. She hated them. She sucked big-time at drawing. (I know–I saw her work!) So why was she in art school? “I don’t want to draw! I want to make stuff! Things that do things!” she exclaimed. Like what?, I asked. She pulled out some of the items she’d made in her high school art classes. We sat on the floor while she showed me all her little mechanical contraptions. And one of them was a traveling salt cellar. I don’t know why it stuck with me lo these many years. It was a silver salt holder, with a tiny handmade silver spoon, mounted on a sort of cart-like contraption with little wheels. You pushed it across the table. It was adorable. Badly made, but adorable. The wheels were uneven and not mounted properly on their axles, so the salt shaker sort of lurched across the floor. “I need to know how to make good wheels that really work. I need to know mechanics or something. I don’t know! But I can’t do anything else til I take all my prerequisites!” Which at the time was about two to four semesters of…..drawing. I know there is discipline to drawing. I know it is a deep way of really “seeing”. I know for many people, drawing is a way of working out design elements, structural elements, etc. But this woman had taught herself casting and soldering and metal working. Figure drawing didn’t figure into her game plan. (Sorry for the pun.) Her “smarts” were in a different area, one that, at the time, was not acknowledged or respected in regular “art school”. 3) Now let’s really fast forward to the mid-90’s. I’m a Tae Kwon Do student with a wonderful teacher who later became a good friend. He was patient, accepting, emotionally-evolved and funny. As I got to know him better, I learned about his school days. Allyn never graduated from high school (though he did complete his GED). He had severe dyslexia. Like my fellow student in the ’60’s, his not-understood and not-diagnosed condition meant he didn’t do well in school. He did so poorly, in fact, that when he was in middle school, he was given a “permanent hall pass.” What does that mean, I asked him one day. It meant that he was considered stupid. He was so “uneducable” that he was allowed to roam the halls during regular classes, as long as he stayed out of trouble. Everyone pretty much assumed (and some still assume) he’s just not very bright. Allyn also happens to be one of the most perceptive, insightful, emotionally-evolved, and intelligent people I know. He listens deeply, and observes carefully. Whenever I encounter a puzzling social situation (and I encounter many, because that’s who I am), I call Allyn. And within a few minutes, he can tell me exactly what’s going on. In one sentence. I kid you not, he understands the motivation, the behavior and the dynamics and can summarize it quickly and easily. I mentioned this to a friend who was taking graduate coursework in stuff like organizational dynamics. What she told me knocked my socks off. Turns out that many people with so-called “learning disabilities”, especially dyslexia, cannot easily process information through reading. But their brain, like anyone else’s brain, is still trying really, really hard to learn, to make sense of their physical, social and emotional environment. So these non-readers pay very close attention to everything that’s going on. They learn to see, to observe, and assess. They become highly skilled in areas that don’t involve reading and writing. Unfortunately, since so much of our educational system is based on reading and writing, they rarely make it to college. They aren’t considered “smart” by most of the markers we consider for intelligence. I think it’s getting better. We “normal people” are learning. I like to think that if we spent less time drawing lines around who is and who isn’t an artist, who is and who isn’t talented, who is and who isn’t creative, who is and who isn’t smart/pretty/famous/whatever…..maybe we could simply be astonished by the incredible diversity around us, the remarkable creative range and emotional depth and loving heights the human spirit is capable of. Maybe we could just let people enjoy the making of whatever makes their heart sing, and give them permission to do so. And in the end, it’s not so much what’s in our brain, as what we do with it. My rabbit Bunster has taught me many lessons. I took her in on a raging impulse. We’d moved into our new house, our aging cats had moved on, and we had no furry responsibilities. It was freeing. But it was also a little lonely. I saw a little handbill at our local Agway store–“Free Bunny!”. Hmmm. Well, a rabbit wouldn’t need a litter box, or walks. Surely this would be a low-maintenance pet? I called the number. The nice woman said her daughter had left for college and could no longer care for the rabbit. I went to her house that same day, and brought Bunster home. The first lesson was not to make assumptions about animals. I thought rabbits were like large hamsters–perfectly happy in a small cage and not needing much from me beyond basic care. Boy, was I wrong. First, the cage I was given was way too small. Bunster was so stir-crazy from being in a cage she could hardly turn around in, she used to grunt and lunge at me when I opened her cage to feed her. She terrified me! Had I acquired a vicious rabbit?! Shades of Monty Python and the Holy Grail. Visions of killer rabbits haunted my dreams. She finally escaped one day into our mud room, and transformed into a totally different beast. Soon she had the run of my studio, too. I was dismayed at the amount of bunny poop I had to deal with. But I did it. She hated to be held, but one day while I was at my computer, she leaped into my lap. We both looked at each other in astonishment. Then she grunted and fled, never to repeat the caper. She was an ambassador for visitors to my studio, and she took her responsibility seriously. I would keep a bowl of Cheerios handy for guests to feed her. She would grunt and thump her hind foot if they were too slow with the treats. She was a devastating force in a fiber studio. She chewed through power cables, extension cords, fabric, furniture, rugs and wood furniture. Many people wondered why I put up with it. I honestly don’t know. Maybe I thought she would change. (Hah!) I do know I became better about putting things out of her reach (about 16″) and quickly found someone who could repair chewed cords. And I loved the tiny scraps she made as she demolished my fabric collection. Many of them appeared in my collages. Her biggest lesson was about fear. I would forget that to a rabbit, everything in the world is dangerous. One day I introduced my new cat Gomez to Bunster. He sniffed her and looked up with me with adoring eyes. Then he slowly reached out and grabbed her by the neck wish his teeth. No, Gomez, I was not bringing you lunch. Fortunately, Bunster was unhurt, though thoroughly miffed. She was quite the escape artist. Visitors would unwittingly give her an opportunity to dash out the door. I could usually nab her and bring her back inside. But one day, she was just gone. I searched for two days, despairing of ever seeing her again. While I was hanging posters around our neighborhood, someone came by in a car. Seeing the poster, she told me she’d taken a wounded “wild rabbit” to a local vet the day before. With hope filling my heart, I called, and sure enough, it was Bunster. She had survived over 24 hours outdoors, through a thunderstorm, neighborhood dogs, hawks, coyotes and feral cats. She’d collapsed in a rain puddle, exhausted and frightened. But someone found her and took pity on her. Even a small life is worthy of our help. A miracle indeed. She didn’t run off again after that. And of course, there is so much a rabbit can teach you about fear. Now Bunster is old. Really old. I thought bunnies lived to be 5 or 6. Turns out it’s more like 10 or 12, with good care. Bunster is at least that old, maybe more. Her sight has dimmed, though her hearing seems good–when I bubble “Bun bun bunny bun bun!” at her as I walk by her cage, her ears perk up. She can certainly hear a box of Cheerios being opened. Her appetite is excellent, especially once I decided she doesn’t have to “eat healthy” anymore. She loves Doritos and nuts and crackers. Someone gave her a Cheeto recently, and she scarfed it down. But her once-beautiful fur is ragged and rough. She is frail, and moves with difficulty. She sleeps a lot, dreaming of large fields of clover (I hope) and sunshine. Every day she is still here is a gift. Her last gift to me is one of quiet contemplation. She lets me hold her now, something I yearned to do for years and is now so easy. I hold her like a baby, gently, supporting her carefully. If I keep my movements soft and quiet, she relaxes into a dreamy state. Together we sit, and ponder, alone with our thoughts, her feeling my protective hands around her, me feeling the now-so-light weight of her diminishing body. I’m so grateful for these last few precious months. Or weeks. Or days. I have no idea. One day I think it’s her last. The next, she’s back to her perky, demanding self. More Cheerios! Quite petting me! Where’s my hay! Should I have her put down? She doesn’t seem to be uncomfortable or in pain. I will try to simply follow her needs. Maybe, I hope, I won’t be called upon to decide anything. As I read the news today, full of cruelty and anger, revenge and strife, of thoughtlessness and sickness and pain, there is solace in this: Holding an elderly bunny. She is giving me the gift, in the middle of this perfect storm of feeling un-moored, adrift, uncertain, unsettled, the gift of peace, and content, and reflection. I look at this seemingly insignificant little creature who has meant so much to me, and I am astonished. I had no idea, when I brought her home that day, how much she had to teach me. We are adrift in time, in these soft moments. She is my hope. My meditation. My prayer. 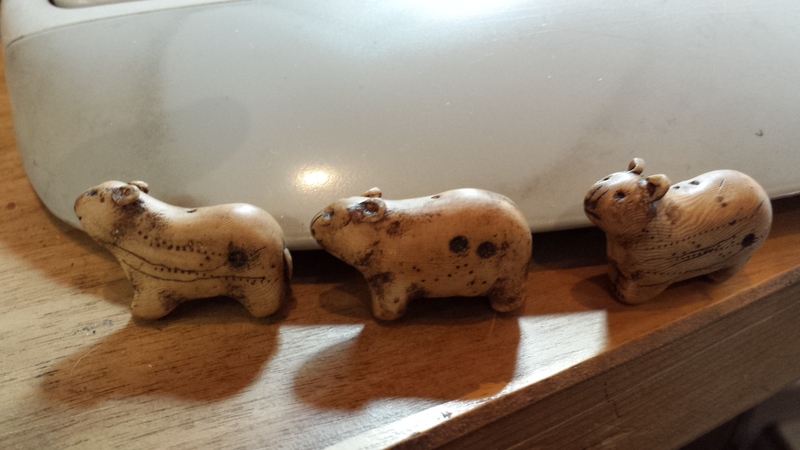 Bear beads I sold recently. Yep, I lined up right in front of my keyboard! I haven’t written much lately because it seems like very day, the landscape changes. The things that have to happen before we can move seem obscured. Some days it’s hard to put on a happy face. We’re wishing desperately for clarity. But getting clear on your next step doesn’t necessarily mean a clear path. We know we want to move to California. Unfortunately, the support we think we need isn’t there. A new job to replace the one that’s disappearing in a week or so may not be so simple to find. The house has to sell, and there’s not much we can do to to make that happen. Plans in place for family members that don’t want to go with us are still up in the air. We keep thinking those obstacles have to be overcome before anything else can happen. When they aren’t happening, we think we’ve lost our way. But it just occurred to me that we have the real blessing in hand. We know what we want. The simple idea that drives everything for us right now–going west–is more clear than ever. Everything–everything–points us west. Jon called from the coast today with a powerful insight: He already knows the work he wants to do. And though perhaps no one will hire him to do it, maybe it’s time he took it solo. I could hear the excitement and happiness in his voice when we spoke. Yes, it’s a risk. But no more of a risk than anything else we’ve ever pinned our hopes to. I realized that all the doors we thought were closing, leave the hallway clear and open. The “bumps in the road” are simply streamlining our purpose: Get west. Go to the place we want to be. Trying to fix everything, trying to put everything in place first, gets in the way of what we want: So maybe it’s time to think slow. Sometimes looking for the “safe” way to accomplish our dreams, will actually constrict our dreams. So we will dream big. Sometimes the people we think we need to take care of, can actually take care of themselves better if we give them the chance: Let them know we will always love deep. So many wise people in my life have told me, over and over, that whatever I yearn for, whatever I need to know, is already in my heart. It’s true. We wished for clarity, and we already have it.